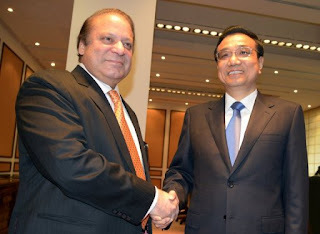 pakistan politics Nawaz Sharif Visit To China A Success Or Failure? Whenever any Pakistani head of state visits a foreign country specially United States or China this debates starts everywhere in media if it was a successful visit or a failed one? Recently Pakistan's Prime Minister Mian Muhammad Nawaz Sharif Visited China along with a small delegation and done agreement on many projects with the Chinese Authorities. Most of people are declaring it a very successful visit which will greatly help in developing Pakistan in next 3 years and will also help to resolve the Load Shedding issue in Pakistan. China has always helped Pakistan in difficult times and believed more in doing trade with Pakistan instead of giving aid. Right now Pakistan and China are doing trade of $12 billion dollars which will increase more in coming months and years. Gwadar project has great importance for China as it will prove great trade gateway for China. China wants Gwadar project to complete as soon as possible. a direct road from China to Gwadar also needs to be built for the trade purpose. Some countries definitely don't like this increasing cooperation between Pakistan and China and they will try to create hurdles in the these projects. but Nawaz Sharif's Govt will have to complete these projects in time to take Pakistan on path of progress and ending the huge problem of Power shortage.